Patent, Trademark, and Copyright Laws is a must-have resource for intellectual property practitioners and includes the most important patent, trademark, and copyright laws in the U.S. Code in one convenient volume. This edition adds to the CD the provisions of H.R. 5447, the “Music Modernization Act,” which passed the House of Representatives 415–0, and a counterpart bill, S. 2823. The bills would create a licensing process for streaming services, create royalty rights for owners of copyrights in pre-1972 recordings, and provide royalties to sound engineers and music producers for use of recordings on which they worked. The CD also includes the “ACCESS to Recordings Act” (S. 2933), which would extend federal copyright protections, including limitations and exceptions, to sound recordings created before 1972, as well as S. 2559, which the Senate Judiciary Committee reported out to implement the Marrakesh Treaty of 2013, an international treaty to help disabled people access books. The text of H.R. 3978, which would amend Section 8 of the Securities Act of 1933 to require the SEC to seek a subpoena before accessing proprietary source code from high-frequency traders, is also included on the CD. 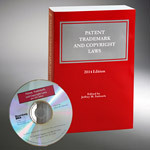 Patent, Trademark, and Copyright Laws includes an updated CD-ROM with the full text of the book along with additional useful materials such as the Rules of Practice of the U.S. Court of Appeals for the Federal Circuit, key international treaties, legislative history, and the text of several proposed patent reform bills. Don’t miss this opportunity to have the latest legislative developments affecting U.S. intellectual property laws at your fingertips. Patent, Trademark, and Copyright Laws is authored by Jeffrey M. Samuels, the David L. Brennan Professor of Law and the Director of the Center for Intellectual Property Law and Technology at The University of Akron School of Law, Akron, Ohio. He was formerly assistant commissioner for Trademarks, U.S. Patent and Trademark Office and Managing Editor of Bloomberg BNA’s Patent, Trademark & Copyright Journal.